This procedure must be followed on the day of Pushya Nakshatra. It is good, if this nakshatra falls on Sunday or Wednesday and it is not mandatory to be followed on Sunday or Wednesday. Get some bermuda grass (Garike Hullu in Kannada ; Arugampullu in Tamil) and extract juice from it, without mixing water to it. If needed you can use one or two drops of water. Dont use either steel or any other metal plates to collect the juice. Use glass or silver plate to collect the juice. If silver or glass plate is not available, you can collect it in the leaf of Honne mara. 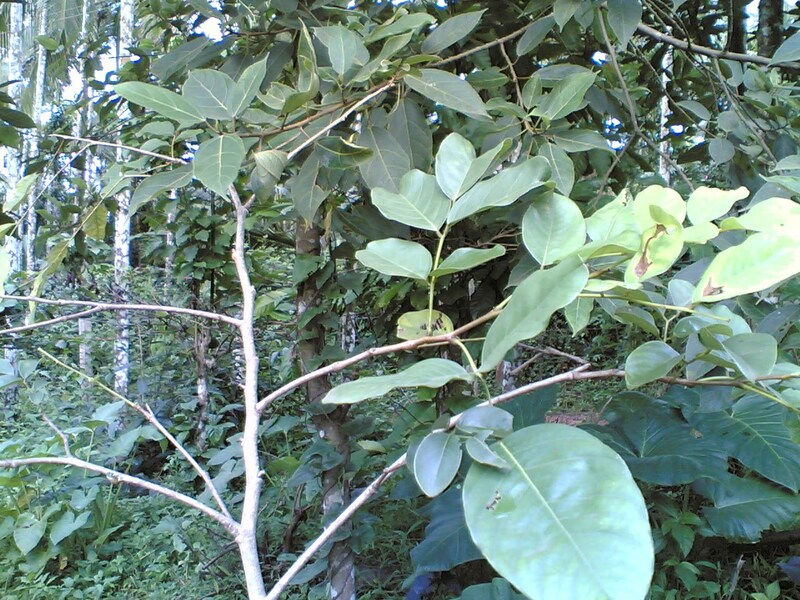 Get two fresh bright green leaves of Malabar Teak or Honne mara (Pterocarpus marsupium) before 12:00PM or between 05:00 to 06:00PM in the evening on the day of Pushya Nakshatra. One leaf is used to collect the juice extracted from Bermuda grass and the other one is used to write the beej mantra in it. Now mix the powder of Spikenard (Jatamansi) in the juice extracted. Now take any one of these - Dried Arka's (Bili Yekka in Kannada ; Vellai Erukku in Tamil) flower or leaf or stick. Powder it and mix along with spikenard. Prepare Sandalwood paste by simply grinding the wood on a stone (Sane Kallu) or granite slabs with water to extract sandalwood paste. Now mix this paste along with pinch of Edible Camphor (Pacha Karpooram) to the juice extracted from Bermuda grass. Prepare Arishina paste by simply rubbing the Arishina Kombu on a stone (Sane Kallu) or granite slabs with water to extract arshina paste. Now mix this paste with the above mixture. Now take a small piece of stick from Krishna Tulasi Plant. Now start writing "OM" , below it "SHREEM" and below it write "GAM" with the mixture of paste obtained above using the stick from Krishna Tulasi Plant. You should start writing from the tip of the leaf i.e the tip of the leaf should be at the top and the Petiole part should be at the bottom. After writing these three spiritual words, you should write your problem related to anything like Education, Financial, Relationship etc. Now roll the leaf from the tip and tie the thread to the leaf along with petiole. Place this roll in pooja room i.e on the night of pushya nakshatra and offer your prayers. Next day morning, take this roll and tie it to Neem Tree. The Neem Tree should be next to Aswatha (Banyan Tree) and it should be fit for offering pooja. Within 11 days you will get rid of your problems. BENGALI : Pitsal, Pitshul, Piyashal. ENGLISH : East Indian kino, Indian kino, Indian kino tree, Indian kino wood, Malabar kino. HINDI : Banda, Bija, Bijasal, Bijasar, Bijaisaar kaashtha, Biya, Hiradokhi, Peisar, Piasal, Pitshola, Vijaisar kaashthaa. KANNADA : Benga, Bibla, Honne. NEPALESE : Bijayashal, Bijaysar, Vandhuk pushp. SANSKRIT : Asana, Bandhukapushpa, Bijaka, Bijavriksha, Mahakutaja, Mahasarja, Nilaka, Peetasaar, Pitasala asana, Pitasalaka, Pitasara, Pitashala, Paramayudha, Priyaka, Priyasalaka, Sarfaka, Sauri. TAMIL : Pidasaralam, Pirasaram, Pidagarama, Sarvasadagam, Sarudagam, Tamisu, tannini,Timisam, Timil, Timisu, Udiravengai, Vandunarmalar, Vegaimaram chakkalpakal, Vengai, Visaga. TELUGU : Paiddagi chekka, Peddagi, Peddavegisa, Peddegi, Pedegu, Vegisa, Vengisa, Yegi.